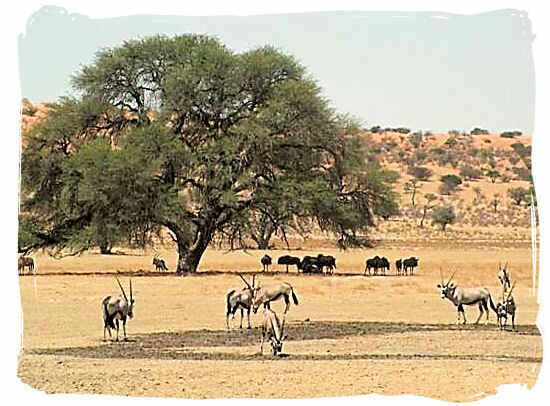 You will find Kalahari Tented Camp nearby Mata Mata rest camp in one of the prime game viewing regions of the Kgalagadi, situated on a huge red sand dune and overlooking a waterhole in the dry bed of the ancient Auob river. 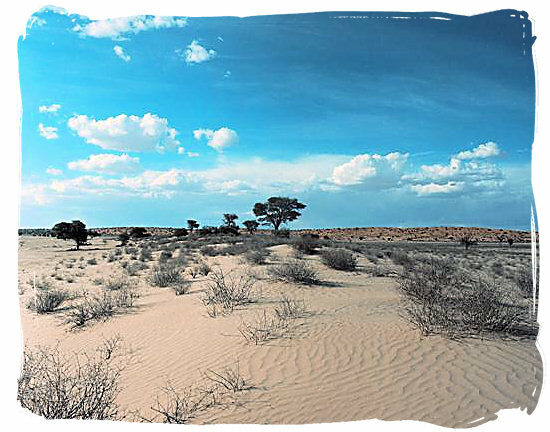 It is one of the six wilderness camps in the Kgalagadi Transfrontier Park, only 4 km away from main rest camp Mata Mata, where Kalahari Tent Camp residents can refuel and get basic supplies at the shop. The camp is not fenced and for your safety an armed game ranger is permanently based at the camp. The lay-out of the small camp is such that you do not notice the presence of other people. 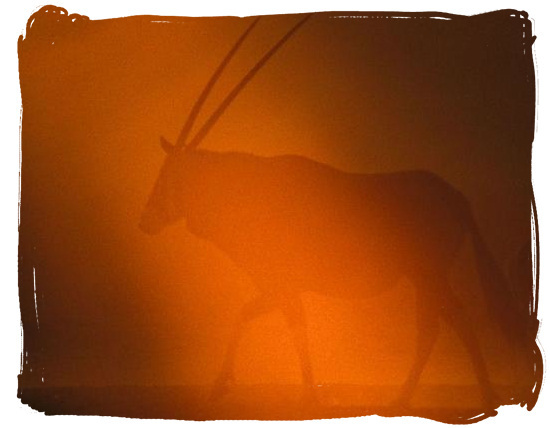 The Kalahari Tented Camp boasts 15 desert tents with rustic finishing using wood, sandbags and canvas exteriors. The atmosphere of the desert tents is absolutely amazing. Just imagine a large sleeping tent with spacious, nicely decorated sleeping room, shower and toilet. A large separate, fully equipped kitchen tent, also suitable as dining room, and a small terrace in between linking the two tents, with excellent views on the Auob river and it's wildlife. Each tent is equipped with a ceiling fan, cutlery, crockery, linen, fridge and braai (barbecue). There is gas for hot water and cooking and solar power for lighting. Close to the camp are some of the most productive waterholes in the park, including its own, which you can see from your terrace. The area around the camp is known for its many Lion and Cheetah sightings. You are not allowed to walk around in the camp after sunset, which means that if you just want to move from one tent to the next, you will have to use your car and drive there. This is not just a an odd regulation, but a necessity to keep you and your family safe as wildlife often move through the camp at night. The camp also has a swimming pool, which is fenced so animals can not get into the pool area. “You just can't walk around the camp at night, the tents however are well protected. Bring a flashlight as it can get pitch dark at night. During our stay, we had (and heard) Hyenas in the camp but again, no threat even close to the tent. Suggestion, stay even more than one night and tour the area from there. Early mornings particularly exciting”. "We were at Kalahari Tented Camp and also got visited by a Genet, who was very proud of its long magnificent tail! He did vanish rather suddenly, and when we shone the torch towards the rustle near our tent we were met by the sight of a male lion meandering past our tent! We were in our tent in record time and spent about 10 minutes velcroing ourselves in and hoping that the lion was not as hungry as the meerkats! 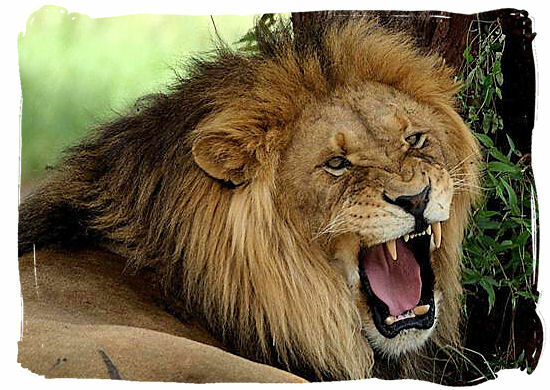 Similar thing happened two days later at Grootkolk wilderness camp with 4 lionesses!" 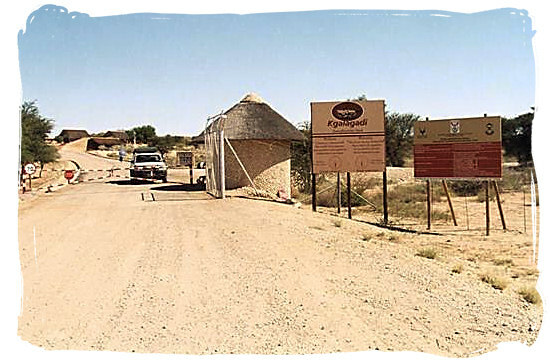 Go to SANParks.org to view the accommodation rate and tariff details of Kalahari tented camp on the South African National Parks (SANparks)organization’s website. Go to SANParks.org top view a monthly calendar with accommodation availability details of the Kalahari tented camp on the South African National Parks (SANparks) organization’s website. Go to SANParks.org to book your reservation for the Kalahari tented camp on the official reservations page of the South African National Parks (SANparks) organization's website.